To make space in our warehouse we need to clear out discontinued lines. We've cut up to a further 25% off our already sale prices for goods purchased from this page. Hurry because they won't last long and they won't be back!!!!! 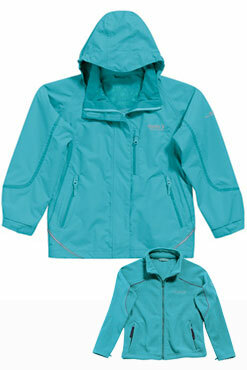 Mystic Dream is a high spec Regatta girls jacket, waterproof and breathable, perfect for summer and autumn days. Please note that interactive fleeces are not included in the deal here. Comfortable, easy care UV protection Navy Lycra shorts from Konfidence (Tested at certified as 98% UV block - UVPF 50+). Designed to co-ordinate with the Konfidence UV T-shirts. Like the T-shirt, can be worn for swimming and also under a wetsuit as rash protection. Stretchy style offers comfort for a range of sizes - you should get a few seasons wear out of them! Pretty cotton feel halter top and shorts 2 piece set from Trespass. Designed to co-ordinate with the Madame hat . 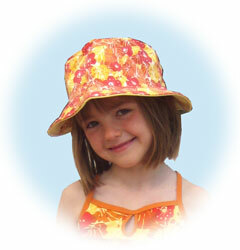 This lovely sun hat is designed to co-ordinate with the Momo shorts and top set. The hat can be worn either plain or patterned side out. Softshell fabric for kids outdoor wear is taking Scandinavia by storm - and we are pretty convinced that the same thing will happen here in the UK. 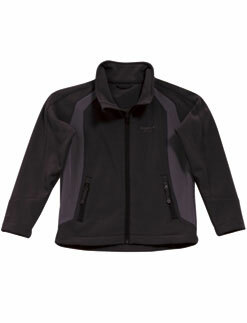 Softshell makes great outdoor wear for kids - it is comfortable like a fleece, yet protective from rain and wind like a coat. Our kids have them and we swear by them - we are sure you will feel the same! Made with hi-tech softshell fabric, these jackets are warm backed, wind and water resistant, lightweight and breathable - ideal for outdoor sports.